NOTE: Recent changes to WordPress seem to have broken the audio on this page. Please use the new Signal Identification Wiki which has many new signals. Anyone can edit and improve the information on the pages on the wiki. A guide to help you identify some amateur and utility digital radio signals and sounds which you may find on the frequency spectrum. Most of these have been received with an RTL-SDR software defined radio. I will be slowly adding more to this list over time. If you enable stereo mix and pass the sample audio to an appropriate decoding program the sample audio should be decodable for most samples. If you would like to suggest a modification or contribute a sample, please send a sample, waterfall image and information about the signal to [email protected], or post in the comments. (Note I am currently backlogged with contributed signals, if I haven’t replied or added your signal yet it will be done within a month or two). More sites with sample audio can be found at this list on dxzone.com. 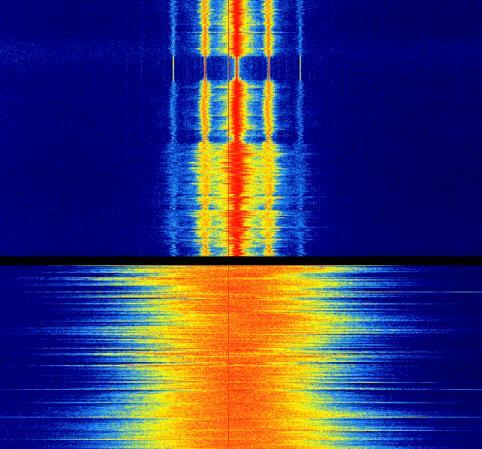 A very nice overview video of the HF spectrum by balint can be found here. There are also two paperback books: Technical Handbook for Radio Monitoring VHF/UHF (PDF Excerpt) & Technical Handbook for Radio Monitoring HF (PDF Excerpt) which have a very comprehensive list, description and images of many signals. Description: Aircraft Communications Addressing and Reporting System (ACARS). Short messages sent to and from aircraft. Description: P25 encrypted digital voice signal with C4FM modulation. Decoding Software: Digital Speech Decoder (DSD). Note, only unencrypted can be decoded. Description: Motorola digital voice signal known as MotoTRBO (pronouced Moto-Turbo). Description: Pager digital signal known as POCSAG. An acronym of Post Office Code Standardization Advisory Group. Description: Weather balloon (Radiosonde) telemetry data. Only transmits during a weather balloon launch. Description: Terrestrial Trunked Radio (TETRA), also know as Trans-European Trunked Radio is a professional mobile radio and two-way transceiver (walkie-talkie) specification. Modulated with π/4 DQPSK. Audio sample recorded in NFM mode. Thanks to Jenda for the submission. Description: Radio trunking control channel. Description: Audio frequency-shift keying (AFSK). Used by amateur radio hams for packet radio, Automatic Packet Reporting System (APRS) and telemetry. Description: Automatic Identification System (AIS). Used by ships to broadcast position and vessel information. Uses 9.6 kbit GMSK modulation. Description: NOAA Automatic Picture Transmission (APT) signal. Used to by the NOAA weather satellites to transmit satellite weather photos. Only transmits at certain times throughout the day when the satellite passes overhead at your location. 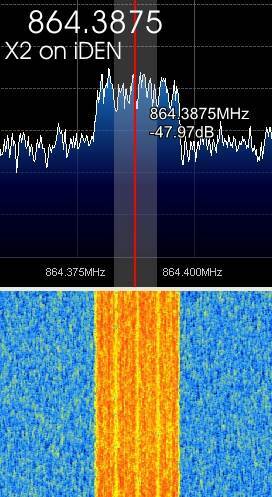 Description: Stereo Wideband FM signal. Used for typical broadcast radio, and in some wireless headsets and speakers. This particular signal is from an AKG headset. 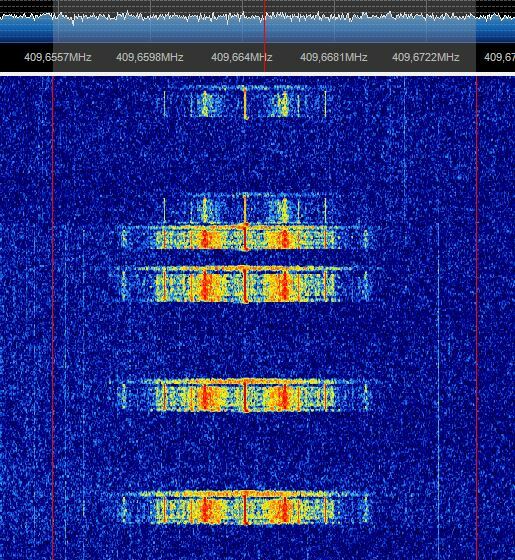 Top signal is WFM transmitted with low amplification. 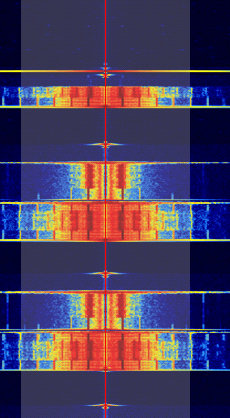 Bottom signal is WFM transmitted with high amplification. Thanks to Tobby for the submission. Medium wave – 531 to 1,611 kHz in ITU regions 1 and 3 and 540 to 1610 kHz in ITU region 2. Description: Amplitude Modulation broadcast audio radio station. Thanks to rtlsdr_is_fun for the submission. 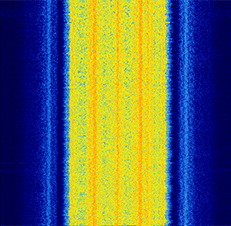 Typical Frequency: HF ~3 to 16 KHz. Location dependant. Description: HF Weatherfax. Used by boats for weather reports. Also Kyodo News, a Japanese newspaper transmits entire pages via HFFAX. Typical Frequency: All HF band. Description: Single side band, specifically upper side band. Used in the HF band by amateur radio hams and aircraft weather reports. Single side band saves bandwidth. Description: Over the horizon radar. Used by governments for very long range radar systems. Description: Analogue PAL TV. Color TV signal. Description: Digital Audio Broadcast (DAB+). A type of digital broadcast radio signal, containing multiple digital radio stations in the signal. Description: NFM signal from a baby monitor. 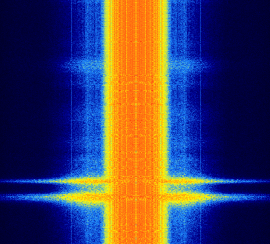 Periodically bursts signal when no audio is detected. Thanks to Dean for some extra info. Typical Frequency: Below 30 MHz on HF, near other shortwave radio stations. Description: Digital Radio Mondiale (DRM). A form of international digital shortwave radio. Replaces AM shortwave radio. Thanks to Will P. for the contribution. 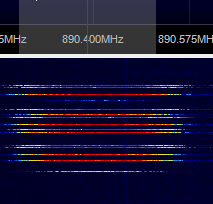 Typical Frequency: All over HF. Description: Standardization Agreement (STANAG) 4285. NATO standard for HF communication. Description: GSM Cell Phone Downlink (Non Hopping Signal). Audio sample used NFM mode. Sample Audio: No Audible Sound Produced. Description: Initial connection GSM signal sent from a cellphone. Description: GSM cell phone hopping. Description: Known as the Japanese Slot Machine. Thought to be data originating from the Japanese Navy. Description: Automatic Dependent Surveillance-Broadcast (ADS-B). Used by aircraft to broadcast their latitude, longitude and altitude. Description: (Previously Unidentified Signal 5). Numbers stations are thought to transmit encoded information for various spy agencies around the world. They are recognized by a voice reading a sequence of numbers or words. 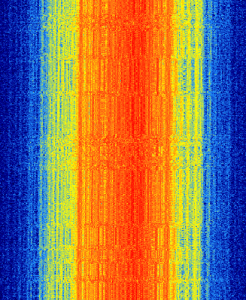 This is a Cuban Numbers Station which has a data portion and a voice portion. Sound sample recorded in AM mode. Thanks to Andrew from the comments section for the ID. 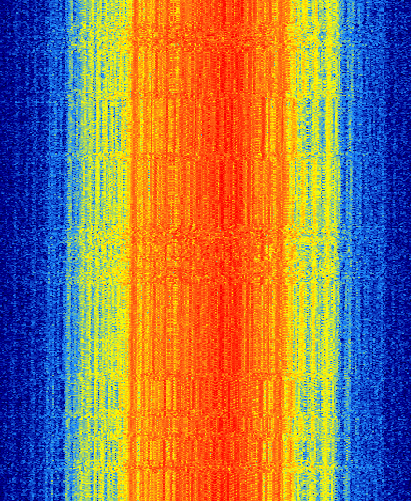 Description: (Previously Unidentified Signal 2). An Aircraft Communications Addressing and Reporting System (ACARS) data link that aircraft use to communicate short messages over long distances using HF signals. Thanks to Patrick for the submission. Description: (Previously unidentified signal 10). Identified in the comments section by Ronen as an Asynchronous Frequency Shift Keying (AFSK) pager link. It is easier to transmit the FSK pager signal to the transmitter site as AFSK. Description: (Previously unidentified signal 9). Identified in the comments section by W1BMW as a Pulse-code modulated (PCM) signal used for remote control (RC) Toys. Link to IQ file http://i.nyx.cz/files/00/00/09/99/999880_c640d91142db39ee7d57.zip?name=SDRSharp_20130613_113322Z_27186kHz_IQ.zip. Sample audio recorded in USB mode. 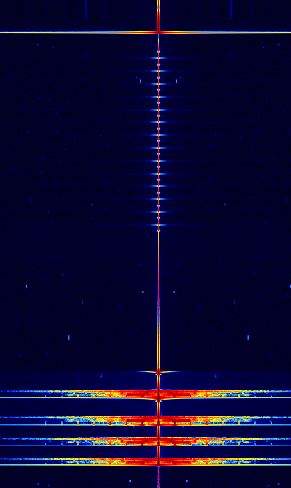 Description: Previously unidentified signal (11). 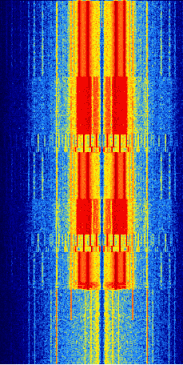 Identified in the comments by various contributors as multiple overlapping RTTY signals sent by ham radios. Description: Previously unidentified signal (13). VFT or Voice Frequency Telegraph is one of several systems for sending multiple RTTY signals over one voice-bandwidth radio channel. Description: Previously unidentified signal (17). 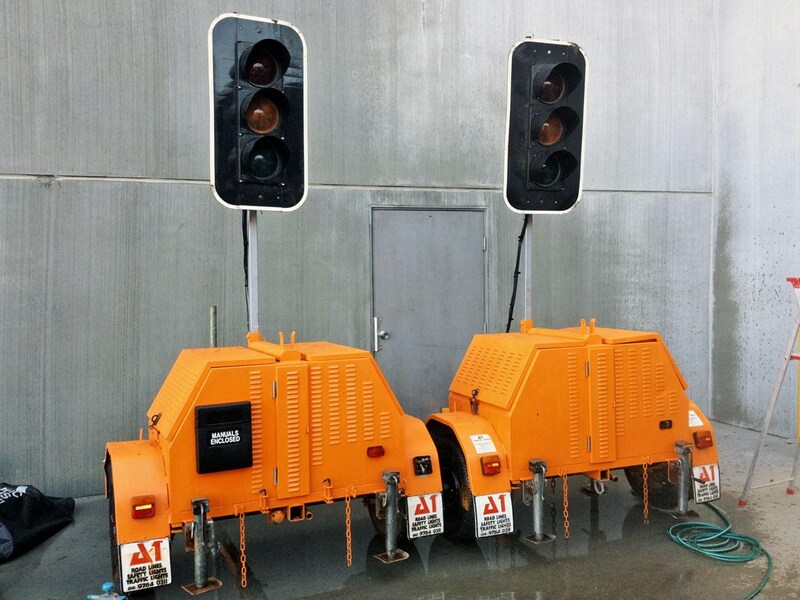 Identified by Peter via email as being signals sent from portable traffic lights that are often used at roadworks. Description: iDEN is an acronym for Integrated Digital Enhanced Network and is a technology developed by Motorola. It is a type of trunked radio with cellular phone benefits. Link to RR identification discussion from submission email. Thanks to Mike (VE3HER) for the submission. Description: The Funcube-1 is a Cubesat amateur radio satellite. Description: A short Pocsag 1200 signal used in electric plants and remote transformer and insulation stations. Thanks to Joni for the submission. Description: Recognized by DSD as a NXDN96 signal, but is disputed in the comments section. (Possibly a bug in DSD). Description: Sound sample recorded in USB mode. Potentially some sort of 2G ALE signal. Similar signal shown in balints HF tour video. Possible a weather map transmitted from Tokyo as noted in the comments section by Syd, or 4xFSK from China as identified by K2RCN in the comments. Description: Periodic pulses. Sound sample recorded in USB mode. 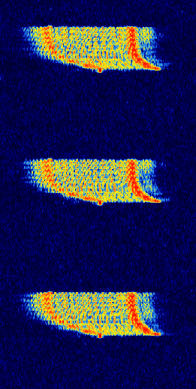 Possibly a GlobeWireless signal as identified in the comments section by K2RCN. Description: Continuous signal. Audio sample recorded in NFM. Description: Continuous bursts. Audio sample recorded in NFM. Description: Audio sample recorded in NFM. Description: Sent in over email. Sounds like Motorola Type II smartnet, but Unitrunker does not recognize. Description: Sent in over email. Repeats every minute. Description: Sent in over email. Hello! 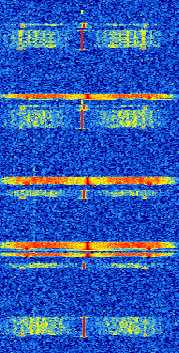 I was listening in the 433MHz band and saw this blip (about 1-2sec) on the waterfall on 433.873 (Millville, MA). It repeats about every 30-50 seconds, though doesn’t seem to be the same every time. Maybe a wireless instrument of some type (weather or something?). 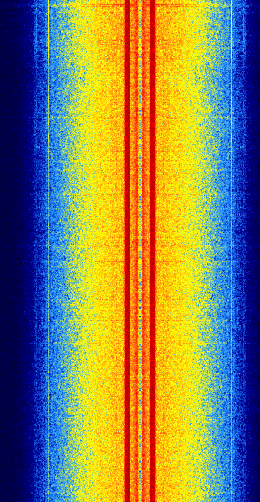 The only clear sound of it I could get was with AM, about a 4.2kHz wide filter (rtl-sdr, gqrx linux). Any ideas? Thanks! The antenna has a Yagi pointed to West from 23.5° South latitude, 47.46° West longitude. The signal can be local or from the sky. The signal is horizontal polarized. Description: Sent in over email. Recorded in NFM mode.